Really enjoying the website and my house is getting cleaner every day thanks to all the tips and the chore schedule. Now my current issue is HOW to get my hubby and our long-term guest to at least KEEP it clean. What rules should everyone follow to keep the house clean for longer? Currently I vacuum every day although I don’t even have carpet. Same basically with every chore, from cleaning the coffee table to constantly picking up after the rest. Like I said, I do give a good example by doing the chores and cleaning up after myself. They just don’t seem to notice. I already thought of the rules “no shoes in the house” and “rinse your plate before putting it in the sink” but have so far been unsuccessful in enforcing them. What other house rules are necessary and useful, and how should I communicate them to (frankly) lazy, uncoordinated adults? I am so glad you’re finding the chore list helpful. The topic of dividing chores fairly among adults comes up fairly often. I am divorced, so please know that in no way do I consider myself an expert on being a great spouse. That said, I do know that relationships take two people to work and both parties can’t check out at the same time or things begin to fall apart. I think you first need to have a conversation with your spouse, out of earshot of your long-term guest. Your spouse may be oblivious to the fact that you have been trying to get and keep the house in better order. A lot of times we, as individuals, make decisions and set goals and don’t say anything about them to our partner. OR we have set these goals and made these decisions so many times that the current goal is lost in a sea of previous attempts. It sounds like you have a few weeks of effort under your belt and that things are improving around the house. Now is the time before resentment really settles in to have this talk. If there are kids involved that adds other variables to the equation, but they should definitely play a role in helping at least pick up after themselves as soon as they are able. I don’t know whether the guest is a close family member or a friend in need. If possible facilitate the guest’s contribution by making sure they are aware of where the tools like spray cleaner, paper towels, rags, broom, etc are kept. Sometimes, as a guest, one wants to contribute but the awkwardness of asking where things are or not knowing how things are done in your home can stand in the way. 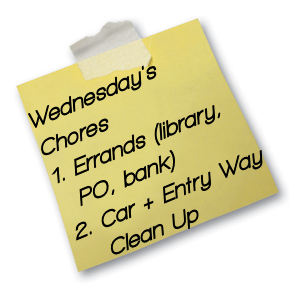 Displaying a chore list in a communal area probably wouldn’t be a bad idea. Acting like a grown up is hard. There are many days I want everyone to just know what I need from them. Life doesn’t work like that. Have the conversation and make sure your spouse has time to express their opinion –listen to that opinion– and together figure out a plan to move forward. Remember that you have a few weeks head start on this goal. You’ve already been establishing a habit of keeping a cleaner home and it’ll take some time for the new household rules to become a habit for everyone else. Be patient, but don’t be a doormat. If you cannot have this conversation, it’s time to talk to an objective, trusted third-party. That may be a counselor, therapist, or if you attend church, maybe someone there. These conversations are never fun, but they are incredibly helpful in preventing resentment from taking root.